You won't believe how easy it is to complete this Little Frogs and Toads Crochet Amigurumi Pattern. Make one of these adorable little guys for anyone who would appreciate crochet stuffed animal patterns. You don't have to go down to the stream or even leave the house to catch one of this cute frogs. Instead, learn why everyone loves free crochet amigurumi patterns and make one of your own. You'll have so much fun making the first one that you may not want to stop. Luckily, you can make a bunch of frogs and toads in almost no time at all. Once you start working on free crochet amigurumi patterns, you may not be able to stop. 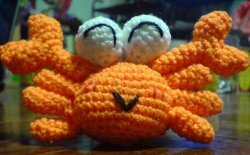 Luckily, there are tons of cute characters to make in our collection of 26 Free Amigurumi Crochet Patterns. Create your own little zoo and crochet a crab, poodle and even a bee. Save these cute crochet patterns and give them to your favorite little one or keep them for yourself and display them on your mantel. Work in a continuous spiral. Using MC, make a yarn ring, work 8sc into the ring. Round 6: Work in sc throughout. Using CC, ch8, join with ss to make a ring. Work as for body to **. Rounds 6–11: Work in sc throughout. Round 4: Work in sc throughout. Do not fasten off, ch4 then CL4 to make a toe, rep twice starting in the same spot. Sew bead eyes or safety eyes onto head. Sew together the head and body leaving a small gap. Stuff. Sew remaining seam. Pinch head and body to accentuate mouth, then use pink yarn to sew together to secure. For warts on toad, CL4 into 2 rows on back. These guys are so adorable. You can almost hear them croaking. I have a lot of plants on my patio and I think a few of these scattered around them would look very cute. I have a pattern for a lizard to add to the group. It will look real because this is Florida. Wow! What a cool pair. When I trust my crochet skills a little more, I'll definitely be giving this one a try. I'm not understanding the step for the Belly #2 Work as for body to **. What do the **. mean? Help please. Hi plp 1959--Thanks for your comment. This means you're going to work steps 1-5 of the body, up until the ** mark. So you'll repeat this: Using MC, make a yarn ring, work 8sc into the ring. Round 1: 1sc in each st to end of round. (8 sts) Round 2: 2sc into each st to end of round. (16 sts) Round 3: *2sc in next st, 1sc in foll 3 sts; rep from * three times more. (20 sts) Round 4: *2sc in next st, 1sc in foll 2 sts; rep from * five times more, 1sc into next 2sts (26 sts) Round 5: *2sc in next st, 1sc into foll 3 sts; rep from * four times more, 1sc into next st. (32 sts) and then continue on with round 6 in the belly section. Hope that helps! Pattern seems to have been translated from French to UK English terms. In that case, 'dc' should be read as 'sc' by us Yanks. Pattern cannot be correct! Says to dc and pic shows sc. Also belly of frog to be 5 more rows than top of body?? That makes no sense!!! You end up with a 6" long belly! Very disgusted with waste of my materials and time. if anyone reads this who can help me please respond! I only wish that I would have read your comment prior to starting this. I hate to say that I also did the same thing and you mention exactly what happened to me as well. I believe that you can make this pattern using the sc as if you are making a circle, then change colors toward the middle when you start to notice that you have the same head as the picture. I dont see why you would need to make separate parts of the body when clearly this picture shows different. This pattern should be taken off the site. Horrible explanation for the legs, absolutely makes no sense and no one posts on here a correction or suggestions. I went to the site of the original pattern and the legs is just as bad there. I had to pitch the whole ides, thanks for the waste of time! Hate to say it but you are very right on this. I finished the frog and when I looked at the picture and the one I made, the head was smaller than the body which comes way out from the head and the legs also are not right either, I also wasted time on this. I really (unfortunately believe) that this was done by the author to make you want to buy her book for 19.99 so you can get the picture that supposely shows you how to put together this mess. once you print patteren it comes out nice. you can understand better. so cute! can't wait to try making these cuties! You might want to check out what was written related to this pattern before you waste your yarn. These are very cute! An idea for lilly pad would be to find a plastic leaf that looks like a Lilly pad at a craft store to set them on. These are very cute! I tried the link that didough so kindly put in for us but it didn't come up. Any suggestions? followed the directions to make these and they turned out like junk. maybe it is just me but I don't like them! Made this using the dc that it called for, looks like an egg. Then I made it using sc and it turned out better, but I think I over stuffed it cause it still does not look like the ones in the picture. Guess I won't be doing this one again!! So frusterated with this pattern. I've tried it 5 times and it won't come out. After looking at the comments and closely at the picture I realized that the picture shows it in single crochet. Checking further I went to the creators blog and found the pattern with is written totally different and in single crochet. All I could get this pattern to do is make a 3" tube. The new pattern makes really cute frogs. Sassier 299 MC is the Main Color of the project you are making and in this case of the Little Frogs and Toads it is: 10g Aran weight/worsted yarn in Green (MC) I hope this answers your question. Can anyone help with the toes? My toes are flat and the toes in the picture look like little balls which are cuter. Your help would be greatly appreciated. With the MC how many do you chain to make a ring, 2 or 3 or 5? Please let me know. It just says to make a yarn ring for the body! It looks like sc to me too! I bet pattern is written using UK terms which would mean dc for them is sc for US. This does not look like double crochet to me.